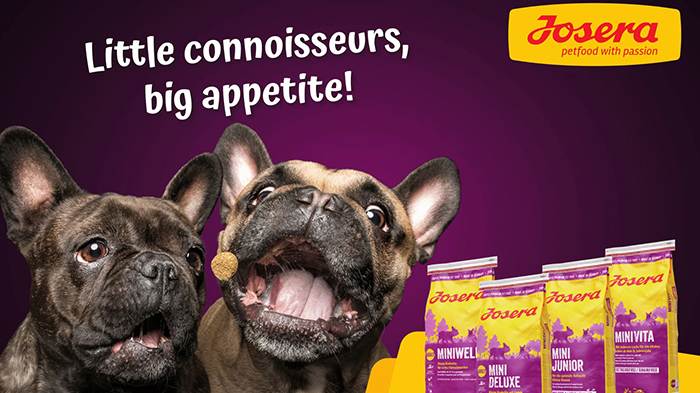 German pet food company Josera has researched the needs of mini canine fusspots and has developed the Mini range . Simon Freear of Passionate About Pet Food, which exclusively markets the products in the UK, said: “Because Josera makes all its food from human-grade ingredients to extremely high ecological and quality standards, dog owners can be confident that they are buying the best,. The Josera Mini range has products for all life stages to suit dogs from puppy to senior citizen. The small size kibble is easy for little mouths to manage and the food helps to prevent the build-up of tooth tartar from day one. Mr Freear added: “Fatty acids help to establish a glossy coat and healthy skin while duck, salmon and natural herbs create irresistible flavour. Cereal can cause itching and allergies in some dogs – but is an ingredient in many pet foods. MiniDeluxe is a tasty cereal-free mix of lamb, vegetables such as sweet potato, herbs and fruits.